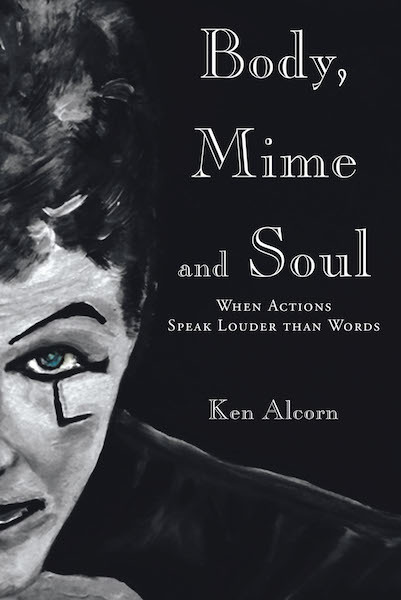 Ken Alcorn can convey more in a set of gestures and physical movements than most can communicate in a multitude of words. The most amazing quality of Alcorn's show is that he said nothing. As a mime, he relied on the basics of human perception and, without saying a word, brought an energy and electricity to the stage that would normally require lots of extras. Ken's wife, Beth Atkinson-Alcorn saved my life. Then we got to know Ken as he put his talents to use at our radio station in between the “calls of the children” with lost lunches, school awards and athletic competitions, juvenile detention rescues, and college graduations. This is real life. And it takes a real life to not only navigate it, but guide four newbies into the varied ups and downs that only excellence demands. Delve into the life of a man who did not speak for a career, but who found his voice in the middle of an empty stage, on the pages of notebooks, within the harmonies of a piano, the lines of poetry and lyrics, paint on canvases, and voice-overs for national radio. Alcorn postponed those particular self expressions, to redirect creative energies into guiding his children into finding their own unique voices. Sometimes pretty tough love. Read the humorous and poignant stories of this godly husband to a brilliant surgeon who, as mime and actor turned full time father recounts the winding journey from the spotlight to diapers and beyond. Where did this fully committed decision lead him in almost three decades that has yet to see its final glory? You will be inspired to walk the same paths with Ken Alcorn.